There are no details supplied with this photograph and the date has been estimated at 1930. I suspect that the fence defines the boundary between the front playground of Handcross School and the front garden of School House next door. 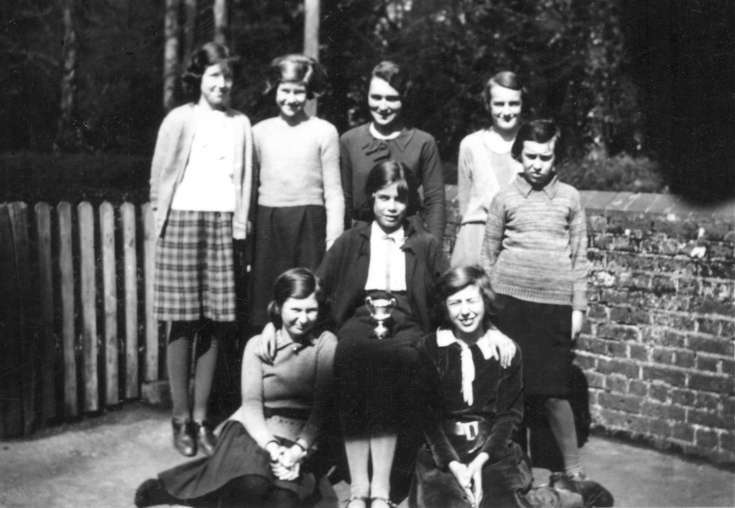 The girl sitting on a chair is holding a cup, and the group seems to comprise a teacher in the back row with seven pupils. I think it is safe to come to the conclusion that Handcross School has just won a competition at netball which is played with seven players in each team. I cannot recognise anybody, but perhaps someone can. Two low-flying black blobs have encroached on to the photograph, but fortunately they did not obscure the faces! Select Open Document to read an extract from the reminicences of Mrs Margaret Carter, formerly know as “Meg” Kensett whose family used to run the shop at Slaugham. She talks about her time as an infant at the “Board school” in Handcross in the summer of 1898. She refers to headmaster James Edwards and his wife, Hannah.